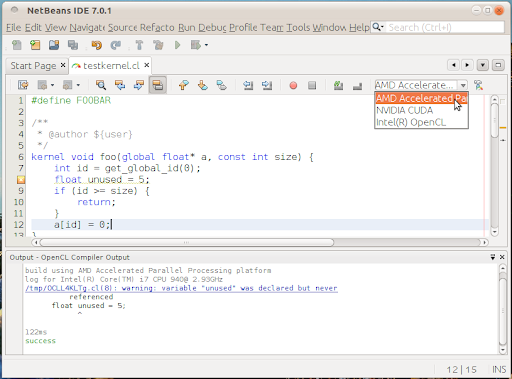 OpenCL utilities for the NetBeans IDE. Since I am doing a lot with OpenCL lately I decided to try to improve the tooling around OpenCL a bit. A weekend later the NetBeans OpenCL Pack was born :). yes thats fine. btw you don't have to press the button. its only needed if you like to see the log. 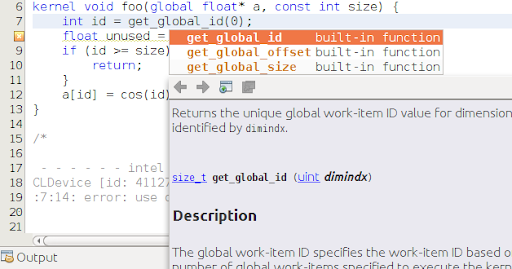 The editor checks for compiler errors automatically and shows them in the editor (like the java editor). So if i get it right, if i press the "hammer" button which looks to be compile button, is it OK to have have output log like this, even i will do programming in opencl? thats the name of nvidias opencl implementation. They use cuda to run CL. The plugin only lists all implementations which are installed on your system. "NVIDIA CUDA" usually ships whith the graphics driver. Regarding the highlighting.. its possible that something is missing, i'll take a look later. you have to make sure that NB itself uses the 1.7 sdk otherwise you won't be able to install the plugin. I am curious if anyone else has had any issues with installing the opencl-editor and opencl-util packages? I have assigned the JDK7 as the java platform, but I still get a frustrating error that says, I am not using 1.7, when in fact I am. Both in the project properties sources and libraries categories have jdk7 and platform 1.7 assigned. Is there some where else that needs it? Does my project need to be created after I install jdk7? (I installed 7 after I had already written my opencl project). I've tried restarting NetBeans, but still no luck. Any advice? So although I had assigned 1.7 to be the active platform, it did not work. However I later removed 1.6 and JDK6.x from my computer entirely. After rebooting NetBeans, it asked if I wanted to use the default JDK, I clicked yes, and everything works. Looking at the properties window, 1.7 is now the default JDK. My *guess* is that, maybe the plugin uses the default JDK automatically, and not the project assigned JDK... Maybe there is a way in NetBeans to re-assign the default JDK but I did not see it. Anyway I hope will be helpful to others who have this problem. If anyone else can shed some light on the issue I would be interested in hearing about it. auto indent is now implemented in the latest version. Thank you so much for the plugin. However, I find that code formatting and auto indent are not working fine in OpenCL editor. Is my installation correct or not?